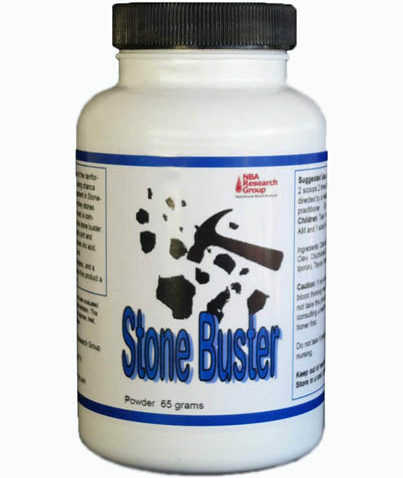 Stone Buster is a proprietary blend of seven rainforest plants. The main ingredient, Chanca Piedra, is used by the native tribes of the rainforest for eliminating and preventing kidney stones and gallstones. Therefore, the herb is commonly referred to as the stone buster. The ability to reduce and eliminate excess uric acid, as well as being an anti-inflamatory, an analgesic, and a muscle relaxant makes this product a powerful pain fighter. The seven plants and herbs listed below makeup this very unique product. Listed below are the ingredients and their reported actions. * for kidney stones and gallstones. * for viruses, hepatitis A, B, & C, herpes & HIV. * to tone, balance, detoxify and protect the liver. * to reduce uric acid and increase urination. * for hypertention and high cholesterol levels. * an immune stimulant & adjunctive therapy for cancer. * reduce side effects of chemotherapy. * for Crohn’s disease, colitis, diverticulitis, & irritable bowel syndrome. * an anti-inflamatory for arthritis & muscle pains, strains, & injuries. * for stomach ulcers & ulcerative colitis and as a ulcer preventative and bowel protector. * an analgesic, muscle relaxant, and a anti-inflamatory for arthritis, rheumatism & back pain. * as a aphrodisiac for loss of libido (male/female) To cool & balance adrenal function. * to tone, balance, and strengthen female hormonal systems, for menstrual disorders, mentrual pain/cramps. * for asthma and allergies. * for respiratory problems (bronchitis, COPD, emphysema, excessive phlegm/mucus. * as a general anti-spasmodic/muscle relaxant. * a pain reliever for colic, stomach & bowel cramping, arthritis, & muscle/joint pain. * for mentrual disorders and excessive bleeding, pain vaginal discharge. * for arthritis and rheumatism. * as an anti-inflamatory and pain reliever for muscle and joint injuries. * for fungal and viral infections…for erectile dysfunction and female fertility. * to relieve pain of all types (arthritis, migraines, headaches, stomach aches, mentrual pain. * for central nervous system disorders (sciatica, neuralgia, mutiple sclerosis, epilepsy, etc). * as a general detoxifier and blood cleanser. * for acne, eczema, dermatitis, and other skin problems. * for emotional fatigue and depression. Curcumin...is a substance in turmeric, that seems to reduce inflammation. Several studies suggest that it might ease symptoms of osteoarthritis and rheumatoid arthritis, like pain and inflammation. In lab tests, curcumin seems to block the growth of certain kinds of tumors. One study showed that turmeric extract containing curcumin could in some cases stabilize colorectal cancer. Other preliminary lab studies suggest that curcumin or turmeric might protect against types of skin diseases, Alzheimer’s disease, colitis, stomach ulcers, and high cholesterol. Curcumin is and anti-imflammatory and an anti-oxidant. Curcuminoids support important blood and liver functions, healthy joints, and your overall well-being, which in turn helps promote radiant and supple skin. *contains high levels of chondroitin sulfate, a major component of cartilage. Contains natural anti-inflammatory compounds. * is rich with niacin, calcium, ta-urine, lysine and other elements to restore brain fatigue and improve memory. * provide vitamin A, B-1(thiamine), B-2(riboflavin), and B-3(niacin), and vitamin C as well as the minerals Calcium, Iron, Magnesium, and Zinc.